One of the nation's largest university-owned teaching hospitals, University of Iowa Hospitals and Clinics and the Division of Cardiothoracic Surgery offer college graduates the opportunity to fill the need for sophisticated health care professionals by becoming perfusion technologists. 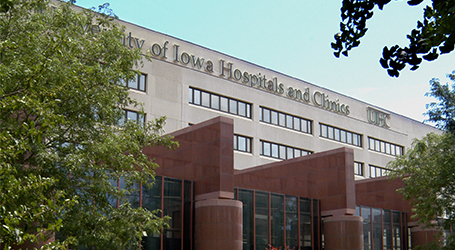 Located in Iowa City, our hospital is the major referral center for patients from Iowa and adjacent states. In this role, UI Hospitals and Clinics provide patients with the most advanced health care techniques and offers perfusionists a unique opportunity to experience a diverse array of procedures and research opportunities. Each year cardiothoracic surgeons at the hospitals perform more than 500 adult and pediatric heart surgeries, including coronary bypasses, valves, heart and lung transplants, placement of mechanical cardiac assist devices and minimally invasive procedures such as robotic mitral valve replacement. In addition to hearts, perfusionists at Iowa assist with Liver transplantation, intra-peritoneal chemotherapy lavage, ECMO, ventricular assist devices and blood conservation. The Perfusion Technology Program started at Iowa in 1992. Our graduates are now spread across the country working in private hospitals as well as academic institutions. Our educational program starts with two semesters of intensive academic preparation and lab work taught by clinical perfusionists and university professors. This is followed by three semesters of clinical education conducted exclusively at University of Iowa Hospitals and Clinics. Students learn at their own pace while working one-on-one during regular hours and on call with our six staff perfusionists. Since we are a large university run tertiary care center, students gain valuable experience with a variety of clinical procedures, both adult and pediatric, including hearts, transplants, VADS and ECMO. After completion of the 20-month post-baccalaureate program, our graduates receive a certificate and are eligible for employment by hospitals, surgeons, and private contracting corporations. The demand for qualified perfusionists continues nationwide and our graduates have a 100% job placement following graduation.